You can enjoy your comfort food in good health with this paleo and whole 30 compliant ground turkey and kale stuffed sweet potato. Thanks to Foster Farms® Organic Ground Turkey for sponsoring this tasty post. How’s everyone doing with their New Year’s diet resolutions? Hopefully you’re staying on track and feeling energized. Sometimes when you start a new eating program, you can feel deprived. That’s why I have today’s recipe for a ground turkey and kale stuffed sweet potato. This is a much healthier recipe than your typical loaded potato with tough to digest ingredients. First, you start with a sweet potato, filled with beta-carotene to elevate your Vitamin A levels. Sweet potatoes have great antioxidant and anti-inflammatory properties, not to mention high levels of minerals and Vitamins B and C, so it’s win-win-win across the board. Then I’m giving you a healthy source of protein with Foster Farms® Organic Ground Turkey. You know I always talk about proper ingredient sourcing, so I’m really happy that Foster Farms® Organic Ground Turkey is USDA Certified Organic. They also use organic vegetarian feed, they never use antibiotics, and it’s California Grown, so I’m eating local. All of that makes me feel really good – even before I eat the stuffed sweet potato! It was easy to find Foster Farms® Organic Ground Turkey at Pavilions, but in Southern California, you can also find it at Safeway, Vons, Albertsons, and Ralphs. I can never let a meal go by without some leafy greens, and kale is one of my favs. Kale provides a big role in detoxification for your body. So if you’re really working on a new diet and trying to get rid of some holiday indulgences, kale is definitely going to be your friend. 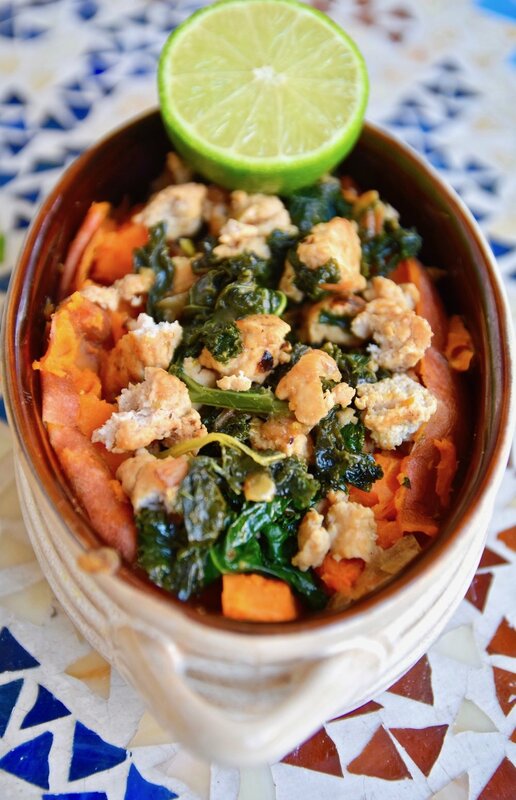 This ground turkey and kale stuffed sweet potato hits all the spots for a great one-dish meal. And did I mention that the healthy, whole ingredients in this recipe are all gluten free, grain free, and dairy free, making it a perfect paleo or whole 30 meal? I hope this healthy stuffed sweet potato gets your year starting on the right food. You won’t feel deprived, but you will feel satiated and satisfied after eating it. Happy New Year! Cook the sweet potatoes. Poke holes in the sides, wrap in foil, and bake in a 425 degree oven for 45 minutes or until soft. You can also cook the sweet potatoes in the instant pot with 1 cup of water for 15-20 minutes (depending on size) with manual release. While the sweet potatoes cook, place a large skillet over medium heat with the ghee or avocado oil. Once warm, sauté the onion until translucent, about 5-10 minutes. Then add the turkey. Cook while stirring and breaking up the turkey pieces. When the turkey is nearly cooked through, add the cumin and oregano and stir. Then add the kale, coconut milk, salt, and pepper. Stir and cover. After 5 minutes, check the turkey kale mixture and see if the meat and kale have been cooked through. Once finished, remove from heat and squeeze the juice of the lime on top. Slice the cooked sweet potatoes lengthwise and fluff the interior with a fork. Add equal parts of the turkey kale mix to each potato and enjoy! Want More Healthy Recipe Inspiration?